Former Fullerton Police officer Miguel “Sonny” Siliceo — recently fired by the department — yesterday pleaded guilty to a misdemeanor charge of PC 149, Assault and Battery by Officer. The conviction follows on the heels of a false police report filed by Siliceo accusing a man of resisting arrest. What the Orange County DA press release conveniently left out is that Sonny was originally charged with PC 118.1, a Felony. As is common with criminal cases, a plea bargain of a lesser charge was offered to avoid going to trial. And what a bargain it was. Not only did Sonny escape a Felony on his record, the plea deal ensured his CalPERS pension would be left intact. Under California Govt. 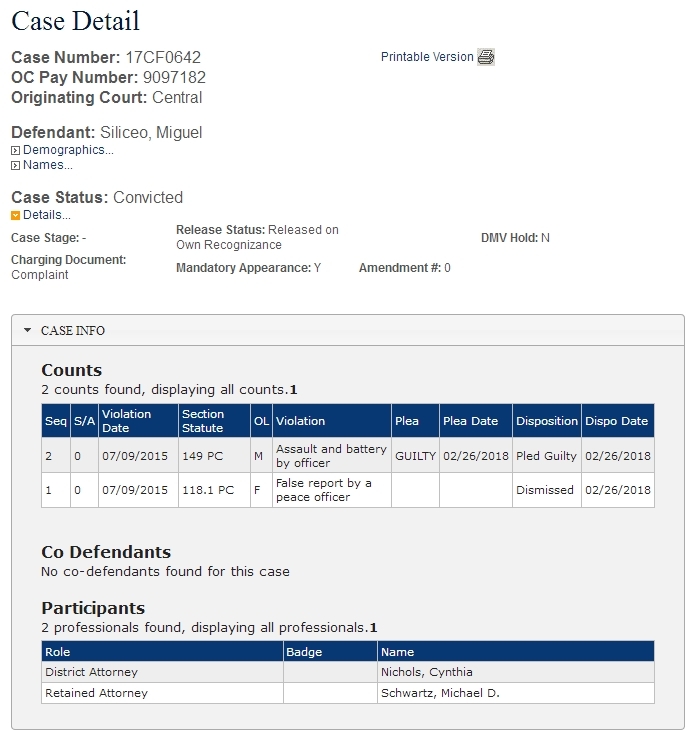 Code section 7522.72, a Felony conviction in the performance of official duties would have barred him from accruing additional CalPERS service credits after July 9, 2015 — the date of the crime. Instead, Sonny remained on patrol until October 2016, and then on paid administrative leave for well over another year, all the while collecting a salary and accruing additional CalPERS credit. Given Sonny’s salary of over $100K, and under the 3% @ age 50 retirement formula, the time between the July 2015 date of the crime and his February 2018 termination guarantees him an extra $7,000 to 8,000 per year (maybe more) until the day he dies. $422,814 to $483,216 — if he lives until age 92. It is important to emphasize this is NOT the total size of his pension, it is the additional amount he will receive after the date of the crime he committed while on-duty. He gets to keep this money because he was convicted of a Misdemeanor, not a Felony. Quite the deal in return for a measly 30 days in Orange County Jail and three years of probation. Crime really does pay when you’re a government employee and the DA has no desire to pursue a felony conviction. He won’t serve but a few days. Too much over crowding, and probation what a joke! Corn Liquor Sonny still goes to Roscoe’s on Commonwealth all the time. Stop by after the dinner hour and tell him what you really think. He usually hides under the same baseball cap. 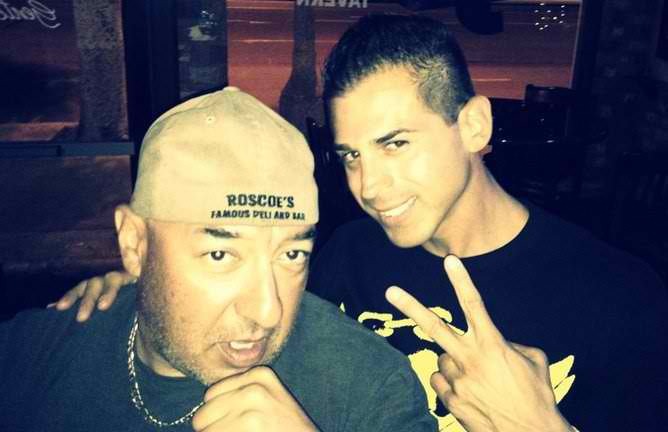 Sonny Siliceo and Albert Rincon. Wow. Fullerton’s Finest. Another MADD Hero. What a joke. Good riddance to one of the biggest cancers the department has ever seen. I was jumping for joy when the news hit yesterday. Nice post by the way. I’m a cop and I agree the Calpers laws need to be changed. No excuses for BS like this. Another one. An unprecedented number of criminals have come out of the Fullerton police department over the last 10 years. How did this happen? And coddled by Danny Hughes. Why would PORAC lobby for change? They love and defend their criminal members. Maybe Sonny can sell real estate with his pal and PARTNER IN CRIME Cary Tong? I can attest to him being a loose cannon at Roscoe’s. I used to play pool there until one night he was drunk and became belligerent after somebody accidentally poked him with a pool stick. He totally freaked my wife out and we haven’t been back. restraints on him. Hampton then used his bare hands to hold Thomas’ legs down while the beating and tasering continued. You’re 100% incorrect about this. 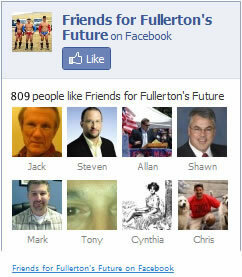 Who is this poster calling themselves “the Fullerton observer”? They have nothing to do with the paper? The new chief is doing a good job. The rats know he can see the good from the bad apples. It’s only a matter of time and Fullerton will be on track to being the good fair city it used to be known for. Like during the Bornhoft Era?